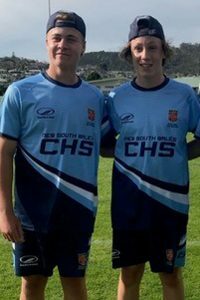 Congratulations to Owen Flaherty and Benjamin Dufficy, both in Year 9, who recently represented NSW All Schools at the Australian All Schools Touch Football Championships in Hobart Tasmania. Owen and Ben played in the NSW Under 15 Boys team and played in a week of games against the various other state teams. The NSW team played QLD in the Grand Final and finished second in Australia.